LRRP (usually pronounced Lurp) Teams in Vietnam were usually made up of Special Forces, Rangers, and Navy Seals and conducted deep recon patrols in the DMZ and behind enemy lines. 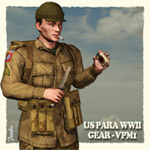 As no camouflage was issued regularly in use at the time, team members were authorized a budget with which to purchase uniforms from other sources. The most sought after was "Tiger Stripe", made locally in South-East Asia for South Vietnamese use, but members of these teams would also purchase commercially available camouflage from sporting goods stores back in the states. They would also often buy uniforms from other sources in the region. Weapons were also commonly a mix of WW2, and current issue, and included enemy weapons as well as those in standard issue to US forces. It was not uncommon to see M-16`s along side WW2 rifles and SMG`s, and AK-47`s or SKS rifles... or even British or French weapons! Jungle Terrain and Vegetation by me. 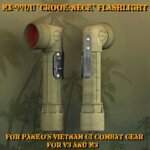 Additional scene props and items from a variety of sources. All items received custom textures by me specifically for this scene. Rendered in DS 4.7.